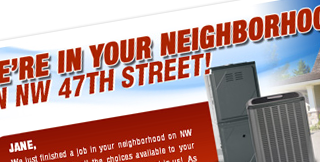 One of the most important parts of any direct mail or print advertising is the headline. It must draw the customer in and either raise a question to which they want an answer, tap in to pain that they’re currently experiencing for which they seek a solution, or make a statement which establishes immediate trust. Here we’re taping in to the pain they may be experiencing and offering a solution. Tie the headline in with a suggestive photo that depicts the headline, then offer the solution and a call to action. The call to action is important. You’re directing the prospect to do something and take immediate measures to resolve the issues you’ve mentioned. Sit down with a pen and pad and think of each product you sell and what some of the issues someone might be experiencing that are most likely to need that product. Then create a question that taps in to that pain, and offers the solution.